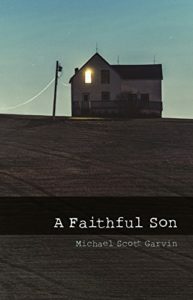 Michael Scott Garvin’s debut novel A Faithful Son has sat on my to-read list for sometime and I’m glad I finally brought it to the top. The story stretches across decades, following Zach Nance from 1959 and on into the late 70s (or perhaps early 80s). Zach spills out the story of his life from the time his family arrived in Durango, Colorado until he’s told all he has to tell. The title tells you exactly what you need to know. Zach spends his life trying to be the good son–doing what he thinks he needs to do in his parents eyes, and, to a degree, his sisters. It makes for a difficult, hard-to-fulfill life for Zach as he struggles to know himself while trying to be the son he thinks he has to be. Among the things Zach tries to keep to himself is that he’s gay. His family certainly tries to keep him inline, such as this from his sister Laura when she senses he’s about to come out: “We all keep things buried in place no one sees. Honesty is a selfish thing Zach. Nothing good ever comes from it.” Of course it’s sentiments like this that likely keep gay people in the closet even in 2016. The beauty in this book is in the narrator. The way Garvin wrote Zach, the book reads as if you’ve sat down with Zach so he can tell you his story–the good, the tragic, the difficult and the loving of it all. From the prologue we know Zach has become “an old man” and it’s from the point of view the rest of the book rolls out. It’s a very effective storytelling technique and Garvin executes it perfectly. I hope this book finds its way to audio because I suspect, in the hands of the right narrator, this tale could find even more power than it has on the written word. I look forward to seeing what story Garvin will tell next because his debut was such a treat.